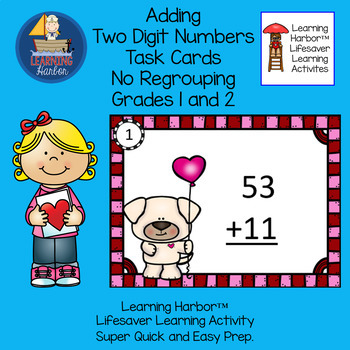 Do you need a math center activity for two digit addition without renaming? 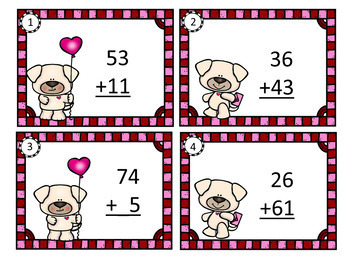 This activity contains 24 valentine puppy love themed task cards for two digit addition without renaming. All cards are in both color and black and white. A response sheet and an answer key are included. 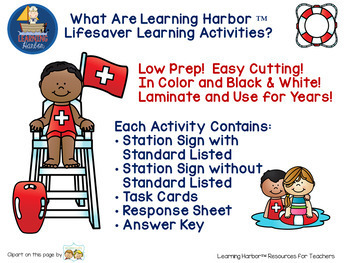 This is a Learning Harbor Lifesaver Activity, so it is very quick and easy to prep and can be used for years to come. Print the 24 task cards (only 6 pages), laminate for durability and cut out. All cutting is on straight lines. Store in a binder pouch or a zip lock bag.